Hello Scrappy Peeps! And a Happy 4th of July!! Its Evi here for Locker Room Tuesday. For todays post I am playing with the wonderful May kit which is still available for your scrapping pleasure in the Clique Kit store. This kit featured the Pink Fresh Studio Dream On collection with these soft pastel color range. I wanted to challenge myself to use a tool I rarely grab for, my punches. I had parts of this kit left since I did use most of it last month. I have circle punches in a variety of sizes in my stash, so I punched out 2″ , 1.5″ and 1″ circles and rings with all the patterned paper I had left over. I used my Scotch Tachy glue to adhere all these circles in a diagonal arrangement for my layout. I used the puffy stickers and alphas in the kit for my title and a few more bits around the photo of my family to finish off the layout. Thank you for joining me and if you did not get this kit they are still available in the shop. I have a process video below to watch this layout unfold. 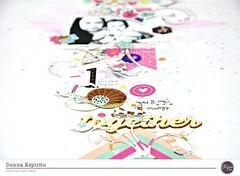 Categories: Locker Room | Tags: clique kits, Evi Cortes, Paper punches, pinkfresh studio | Permalink. I love all the different patterned papers you used. This is so cute! !